People in the old days believed the paradise in Pureland was located in the west. We can find the fact in Byodoin temple in Uji because you will see the phoenix hall to the west when you see it across from the front pond. The west is the direction where the sun sets. 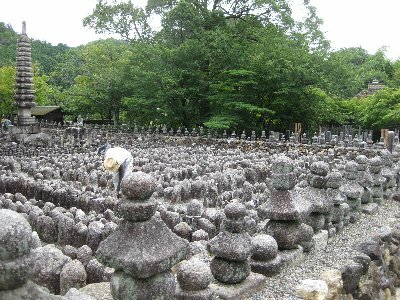 A great monk, Kukai, buried the bodies and the remains there, held a service for the departed souls and prayed for them. People made and brought small stone statues and stone towers. Those in Adashino Nenbutsu dera are the ones for the dead who departed to another world in those days. When you visit there, you will feel something solemn and specifically mysterious. On August 22nd night, the temple holds an event for prayers. People come there and light candles and pray for the dead. There is another stone Jizou. This is for unborn babies. When I visited there, I lit a candle and prayed for them. This time, I visited this temple with a woman from Rumania. We talked a lot about this temple and how death is interpreted in Buddhism. It was a very hot day in summer. 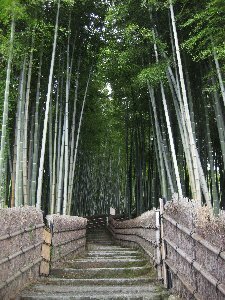 But walking from Arashiyama river side to this temple through the countryside gave us something valuable in our minds. If you are interested in an insight of religion and local culture, visiting here will let you feel something unexpected.